The Hustler, released in 1961 through 20th Century Fox, tells the story of a cocky up & coming pool shark out to prove he’s the best, no matter what the cost. Starring Paul Newman, Jackie Gleason & Piper Laurie, The Hustler was originally set up as an independent production by writer/director Robert Rossen. To lure Newman, who was coming off the 1960 box office hit Exodus (#4), Rossen promised him 10% of the profits from the film. 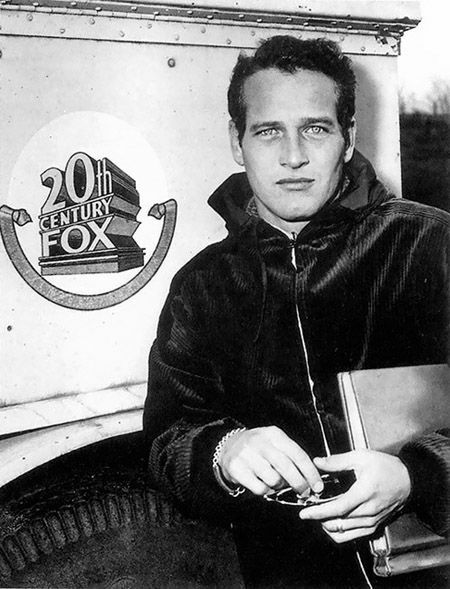 Newman’s involvement, however, guaranteed the film’s financing & Fox came aboard, at no small cost to Rossen. Having directed the classic boxing film Body & Soul (1947) & the political corruption yarn All the King’s Men in 1949, Rossen was no stranger to society’s unseemly underbelly, which made him the perfect director to bring novelist Walter Tevis’ characters to life. 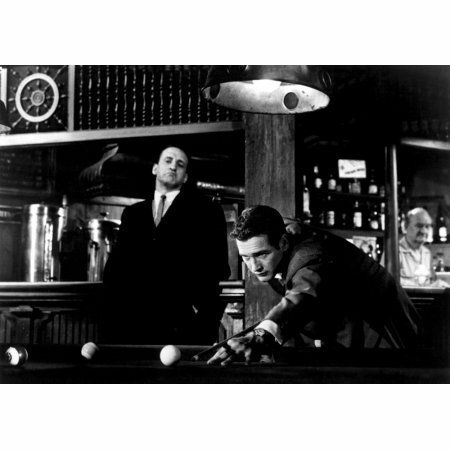 Rossen favored shooting his films is black & white & shot most of The Hustler on location in New York pool halls, with both combining to give the film its gritty, seedy feel. To help in editing the pool scenes, black & white Polaroids were taken of the pool balls to help match them from cut to cut. During shooting, producers thought the title would invite confusion in customers, however, thinking the movie might be about prostitution, so they considered changing the title to “Stroke of Luck” or “Sin of Angels” before going back to the novel’s title. ​World champion pool player Willie Mosconi was not only the technical advisor on the film, but his hands are often seen in close-ups of Newman’s more difficult shots & appears as Willie the guy who holds the stakes for Eddie’s & Fat’s games. As he was involved on the picture before Newman came onboard, Mosconi had suggested Frank Sinatra for Fast Eddie, but Rossen was already enamored of Newman. Newman admitted that he had never really picked up a pool que before, so Mosconi worked intently with him & Newman was a quick learner, going so far as to move a pool table into he & wife Joanne Woodward’s New York apartment. Gleason was a semi-pro player himself, so his shots in the film are his own. Gleason was a bit of a shark & a bit of a hustler too & during shooting he challenged Newman to a series of games for $1 each, which Newman proceeded to win. Gleason upped the anty to $100 & cleaned Newman’s clock. Newman paid the bet in pennies. 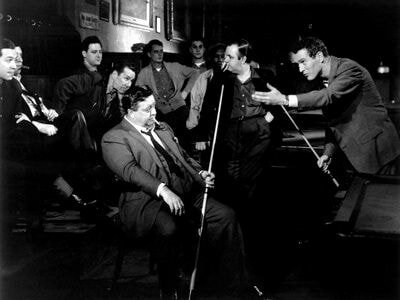 According to Newman’s biographer, several years later Newman was playing pool at a private club in Beverly Hills when a fan approached him & said “I’ve seen The Hustler 3 times & it’s one hell of a movie. I watched you play pool tonight & it’s one of the greatest disappointments of my life.” While apparently not good enough for that fan, Newman was in fact a pretty good player & most of the wide-angle shots were done in limited takes. Rossen & Newman were both very serious about their work, which led to a tense set. Piper Laurie, who plays Fast Eddie’s love interest Sarah Packard was so intimidated by Newman’s good looks that she could scarcely look him in the eye the first few days on set. She later admitted that once you got over “the movie star” Newman was a hard working & supportive acting partner. 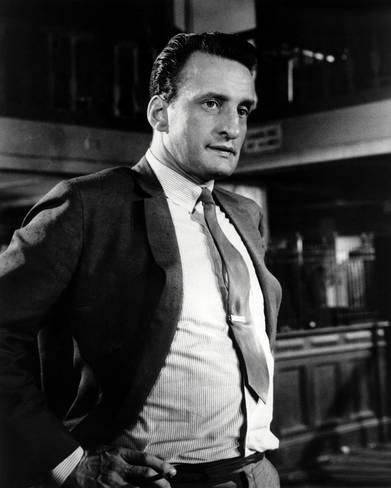 George C. Scott, in only his third film, had already developed a reputation as a difficult actor & Laurie avoided him throughout the shoot, with Scott keeping his distance from the rest of the cast to maintain the icy relations necessary for the part. Gleason, however, couldn’t avoid a bit of a sight gag, so look for the carnation on his overcoat, with another one on his suit jacket just beneath it. When questioned about the visual, he joked that he also had a carnation stapled to his chest. In 1961 20th Century Fox was going through a creative drought & Cleopatra, not released for another 2 years, was already sucking the financial life out of the studio. With finances constrained, the release of The Hustler was presented in an understated manner, with the premiere in Washington, DC. Newsreel coverage of the event, clearly not understanding the story of the film, focused on the corruption focused congressmen who attended the screening for potential educational opportunities. While reviews were generally strong, it took Richard Burton throwing a screening for the casts of Broadway plays to give the film the positive word of mouth it so badly needed. The Hustler ended 1961 as the 20th highest grossing picture overall & #1 for Fox. When the Academy Award nomination were announced the film garnered 9 total nominations, including Best picture, Best actor for Newman & Best supporting actors for Scott, Gleason & Laurie. Scott famously refused his nomination, calling awards a waste of time. Rossen was nominated for directing & co-screenwriting. The film won just 2 awards, for cinematography & set direction, losing out to 1961’s big winner West Side Story.